Do You Need a Cyclone? 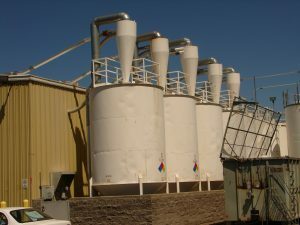 Whether you are in need of separating dust or particulate matter from a processing operation or simply separating of material from a conveying system, we can help. 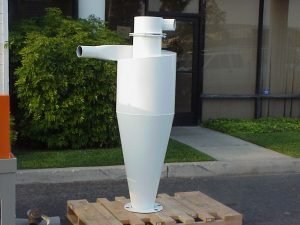 Adaptive Engineering currently supplies standard cyclones that are sized for up to a 4,000 CFM air flow. If your system has a special requirement, our engineering staff will work with you to design a cyclone to meet your specifications. Standard construction for the cyclone body consists of a heavy-duty carbon steel welded body. Inlet and outlet flanges are designed to be floating to allow for flexible orientation and equipment installation. Standard paint for the cyclone is AEF white exterior.